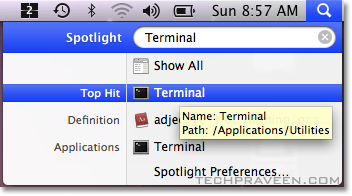 You are here: Home / Mac / How to use advanced features in Mac OS X Spotlight? Spotlight is a powerful desktop search tool for Mac users.Spotlight not only searches files, folders and documents but also messages in Mail, contacts in Address Book, iCal calendars, System Preferences and applications. The Spotlight is located in the top right hand corner of Mac OS X menu bar.To launch Spotlight click on the search icon or use the keyboard shortcut Command key+Space.Search results are displayed instantly as you type. Just type the application name the results will be displyed.Here I tried to search Terminal application.